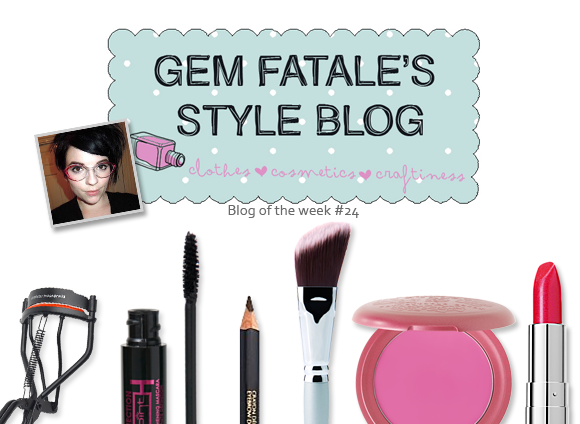 This week’s blog of the week is Gem Fatale, a style blog headed up by the incredibly stylish Gem. I’ll refrain from commenting too much about how much on Gem’s impeccable style (even though I love it), because it’s her simple but genius Tuesday Tips feature that has caught my beauty-loving eye. My absolute favourite tip is one that I heeded just this morning. If you like your lashes completely over the top without spideriness or clumps, Gem has the perfect solution: coat your lashes with mascara, dip your finger in some talc, and coat your lashes with the powder to give your next coat of mascara more texture to adhere to. Keep repeating the process until you’re left with fake-look lashes and a wide-eyed look. Another spectacular idea is the DIY half moon French manicure conducted with – get this – paper hole reinforcers! The rounded edge creates the perfect curve for the tip of your nail, and looks especially good when using contrasting colours. Perhaps Gem’s greatest flash of genius is her perfect polka dot nails created with the balled end of a Kirby grip (try it, it looks fantastic). Gem’s full of these pearls of wisdom, from recycling clothes to creating your own bunting without a sewing needle in sight. If you’re ‘stylish, skint and sewphobic’, her blog is an absolute must-read. Check out Gem Fatale right here. This entry was posted on Friday, June 17th, 2011 at 8:00 am and is filed under Blog of the Week. You can follow any responses to this entry through the RSS 2.0 feed. You can skip to the end and leave a response. Pinging is currently not allowed.